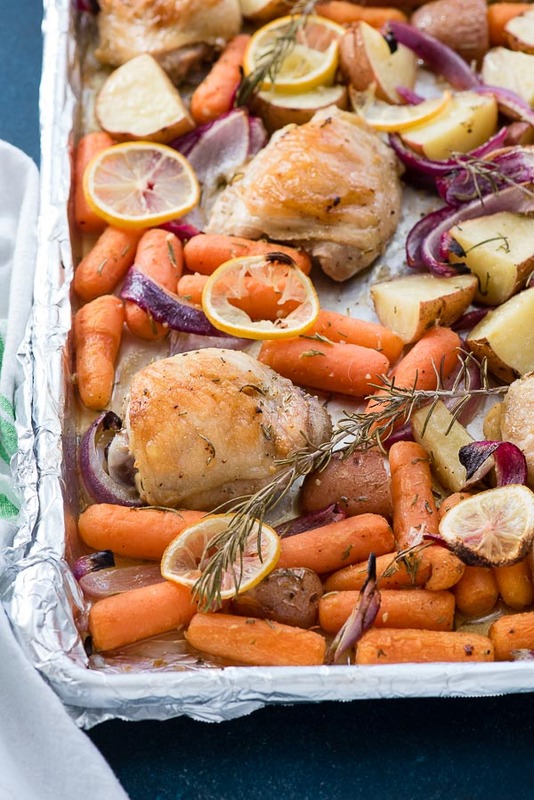 Sheet Pan Lemon Rosemary Chicken Thighs with vegetables is super easy to prepare and bursting with homey flavors. Cooks in 30 minutes with no pre-marinating! I was reminded how much I LOVE a sheet pan meal last week when my collegiate daughter came home to celebrate her birthday and requested Sheet Pan Chicken Fajitas for dinner. The day of her birthday was packed with last minute gift wrapping, cake decorating and cleaning up. I was thrilled to have such an easy recipe to make; 15 minutes to prep and 20 minutes to cook (cue the angels singing on high). I’m getting ready to go out of town this week for some work travel and am distracted by all the preparation needed before I go. Despite this everyone in my household still wants to eat! 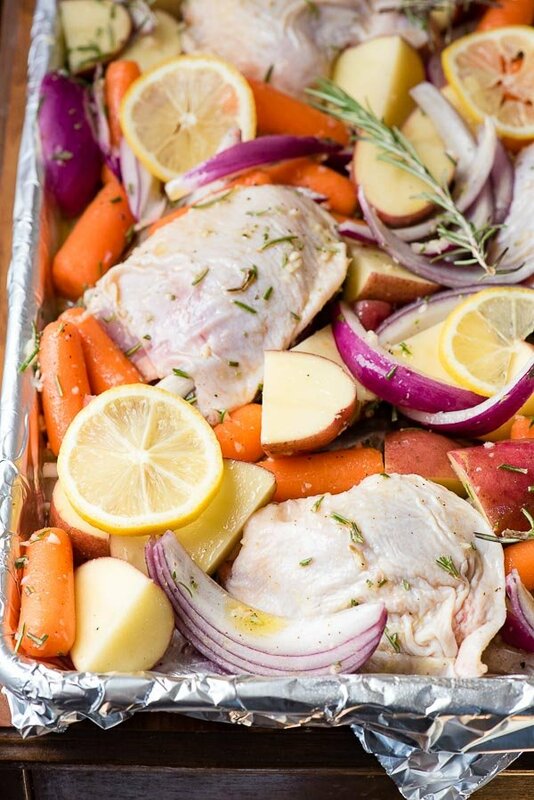 I’ve wanted to develop more recipes for sheet pan meals and Sheet Pan Lemon Rosemary Chicken with Vegetables was born! What is a Sheet Pan Recipe? Sheet pan meals are just that, an entire meal cooked together on one large rimmed baking sheet pan. Selecting things that cook for the same amount of time makes it easiest. EASY CLEAN UP TIP: I also line the sheet pan with foil (the dull side up so the cooking time isn’t affected) making clean up a breeze. Every time I create a chicken recipe for Boulder Locavore using chicken breasts my husband and I have the same discussion. As I’m talking about the recipe he says, ‘you know, I think chicken thighs are better because they have more flavor’. And he’s right. Being darker meat, chicken thighs have more flavor and stay moist while cooking. 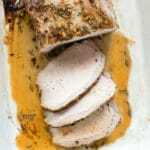 Chicken breasts, especially boneless, skinless chicken breasts can very easily dry out. The skin on the chicken thighs keeps them moister too and crisps to a fantastic texture. Bone-in chicken takes longer to cook (and the bone adds even more flavor)and in this recipe, times out to be ready at the same time as the potatoes and carrots. In a large mixing bowl, all the ingredients for the marinade. Add the potatoes, carrots, onion wedges and chicken thighs. Toss the chicken and vegetables are tossed in the marinade and place them on a large rimmed baking dish (I suggest lining it with foil that is sprayed with non-stick spray for even cooking and easy clean up). Cook for 25 minutes or until the internal temperature of the chicken thighs reaches 165 degrees. That’s it! 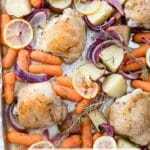 Crispy skinned chicken thighs, perfectly cooked potatoes, carrots and onions with a beautiful lemon, rosemary, garlic flavor is ready for your dinner. 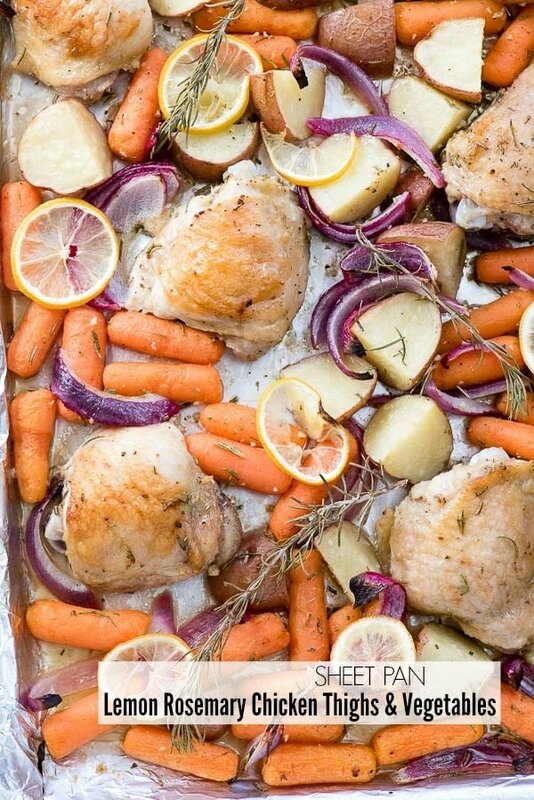 If you’ve tried this Sheet Pan Lemon Rosemary Chicken Thigh recipe RATE THE RECIPE below! You can also FOLLOW ME FACEBOOK, TWITTER, INSTAGRAM and PINTEREST to see more delicious food and what I’m up to! 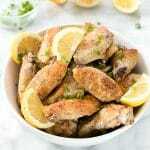 This recipe has beautiful lemon, rosemary and garlic flavors, and cooks in less than 30 minutes! It's an easy recipe and naturally gluten-free. Note: the carrots will be fully cooked, yet firm. If you prefer softer carrots, toss them alone in the marinade and cook for 5 minutes before adding the other ingredients. Preheat the oven to 425 degrees F and line a large rimmed backing sheet with foil, dull side up. Spray with non-stick spray. In a large mixing bowl combine the olive oil, rosemary, garlic, lemon juice, salt and pepper; whisk together. Add the chicken thighs, potatoes, carrots and onion and fold into the sauce to coat. Pour onto the prepared baking sheet and arrange in a single layer with the chicken skin UP and the potato skin DOWN. 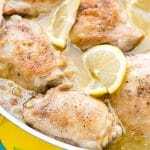 Place lemon slices and rosemary sprigs on top of the mixture and bake for 25-30 minutes until the internal temperature of the chicken thighs is 165 degrees. This has become one of our favorite sheet pan meals! I love that this is so delicious and so easy to get on the dinner table! I absolutely love rosemary and lemon together! I am saving this recipe for sure! This is definitely a winner of a dinner! So good! We love sheet pan meals! thanks or another awesome recipe! Such a great easy dinner! The lemon and rosemary are perfect with the chicken! This is such a fabulous, quick to throw together meal! I’ll be making it again soon! This was way too lemony for me. I only used half a lemon in the marinade and yet it was quite overpowering. I’m a big fan of one pan dishes! This one looks yummy. This looks like my kind of meal. I actually made some oven-baked bone-in thighs the other day. This would have made for some easy sides on one sheet! Looks like a great dish for a large family. Easy to make, lots to enjoy and looks delicious! Talk about a good recipe to make for dinner! I’m sure my boys will like this as well. I like sheet pan meals because the clean up is easy and so is the prep! Sounds amazing! I love making dishes which only take one pan to get it all done! I’m all about the one pan dishes! This one looks delicious, I am going to try this! Sheet pan meals are so convenient, it;s great that they save time and energy. I have a friend that loves using chicken thighs that I bet would enjoy trying this. I have always been a fan of chicken and rosemary, and other spices. I love the addition of lemon to give the meal some zest. Your photos never cease to impress me. They always bring out the vibrant colors of your dishes! I love chicken with rosemary, but the idea of adding lemon juice adds another awesome flavor, not only to the chicken, but to the vegetables as well. I like that it comes together rather quickly, and no pre-marinating! This looks delicious. 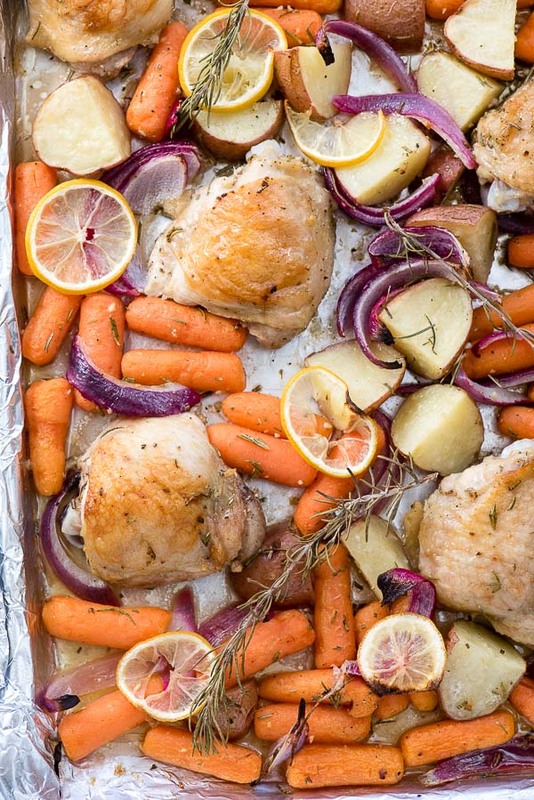 I love rosemary with chicken, and roasted veggies are my favorite. This is the best of all worlds, and it’s a lot easier than doing it the old-fashioned way! I love doing sheet pan meals! 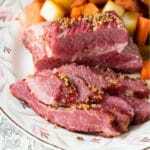 They are so easy and they are so flavorful! 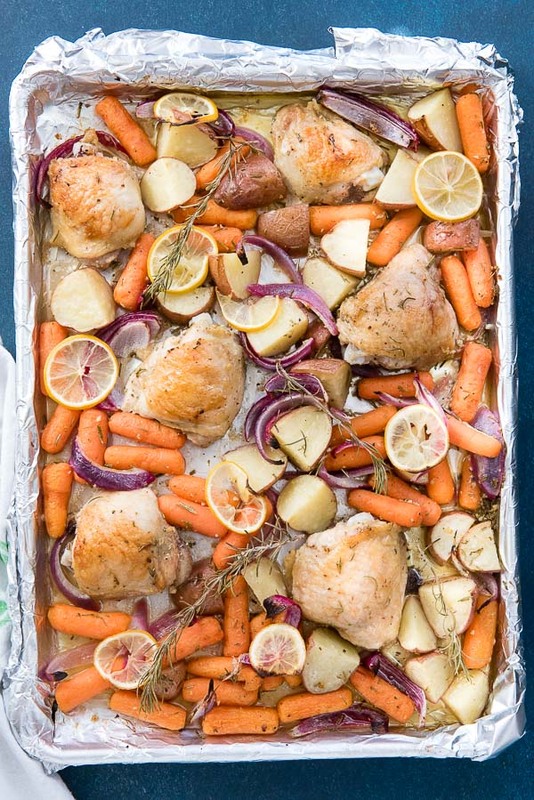 I have been looking for a few new sheet pan meals and this will be added to that list!